We have some great field trips (as always!) to let you in on! Support The Dirty Grind Independent Artist Community and our wonderful family of musicians by going to shows, buying music and, if you have a blog, adding us to your site! Thank you so much for supporting our passion. Also please take a moment and go to https://artistsignal.com/seankagalis and Vote for The Dirty Grind’s Strum Diesel. And that’s it for today! There may be a few other shows from artists who haven’t yet shared their calendar. Have a great day and happy listening. Remember, visit us anytime at http://maps.secondlife.com/secondlife/Fender/77/142/24! Last day of november! Hope everyone is well! Thank yous to all who joined us last night for our release party and shows! You can still stop by an pick up a copy of the SSJ from a kiosk! 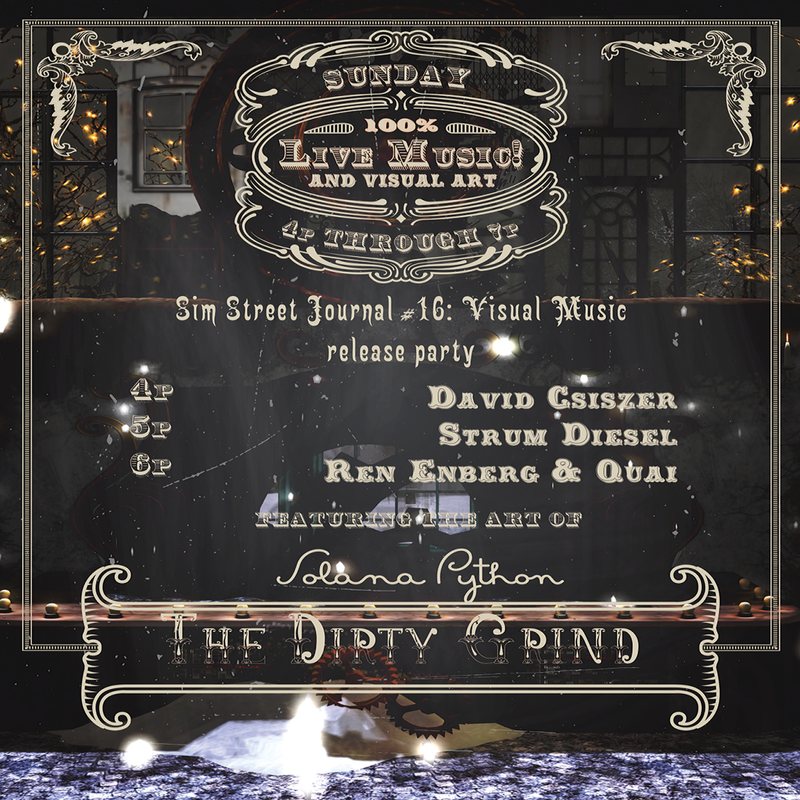 Additionally, we are very proud to announce The Dirty Grind Independent Artist Community has been featured extensively and most beautifully in the current issue (#16) of the Sim Street Journal. Happy Friday everyone! We have some great field trips (as always!) to let you in on! Support The Dirty Grind Independent Artist Community and our wonderful family of musicians by going to shows, buying music and, if you have a blog, adding us to your site! Thank you so much for supporting our passion. The Dirty Grind Independent Artist Community is taking the week off for Thanksgiving but while we are off there are still lots of great shows for you to enjoy around the grid! Support The Dirty Grind Independent Artist Community and our wonderful family of musicians by going to shows, buying music and, if you have a blog, adding us to your site! Thank you so much for supporting our passion. We have some great field trips (as always!) to let you in on! Support The Dirty Grind Independent Artist Community and our wonderful family of musicians by going to shows, buying music and, if you have a blog, adding us to your site! Thank you so much for supporting our passion. Also please take a moment and go to https://artistsignal.com/seankagalis and vote for The Dirty Grind’s Strum Diesel.